Step back Powerpuff Girls, overstuffed kids are here but they are not saving the world. The World Health Organization reported that there is a tenfold increase in child obesity from 11 million in 1975 to 124 million in 2016, between ages 5-19 years old. The majority of these children are from the low- and middle-income countries in all population groups. And it’s simply not about income or wealth, it’s the food system that has increased the accessibility and intensified the marketing of energy-dense but nutrient-poor food almost everywhere on the globe. 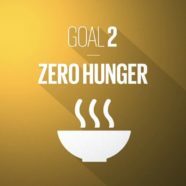 So, while we’re still facing a challenge to provide food for all, we have forgotten the importance of properly managing diets necessary for the youth. 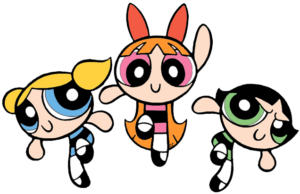 The Powerpuff Girls superheroes were created by chance when their father, Professor Utonium, accidentally spilled his formula “Chemical X” while attempting to make a perfect little girl. In contrast, how much Chemical X are we intentionally feeding the youth nowadays that makes them huge yet powerless? 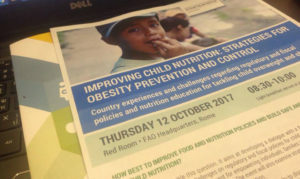 A panel discussion among representatives from the governments of Brazil, Ecuador and Permanent Representation of Italy to the UN Agencies in Rome, highlighted this global phenomenon and shared some country experiences to tackle obesity in childhood. A 3-tier approach was introduced to prevent obesity involving government policies and interventions, promotion of diets and physical activities, and community-based arrangements to support early child care. This approach, I believe, if not properly sustained, might end up in 4+ tiers, when the layers of fat among children grow faster than they can implement their programs. There are also ways of preventing childhood obesity within a food environment as mentioned in the session. This involved discouraging unhealthy food advertisements and promotion, limiting the sale and serving of junk foods in schools, encouraging healthy eating habits through nutrition literacy, and more physical activities. Another way is by imposing more taxes on high sugar beverages and visible warnings on food labels. Efforts like this require much collaboration from all concerned and governing bodies. But hopefully we are not on track to something that will create confusion, similar to the mainstream “Orange is the new black”: we urge them to eat veggies instead of sweets cheering “Bitter is the new sweet!”. We have the goal of nourishing the youth properly, not raising disillusioned little fools. Regulatory actions are vital and play a huge role in restricting the marketing of unhealthy food and misleading nutrition labeling and packaging. If we can put disgusting images on a pack of cigarettes showing the consequences of smoking as a fatal warning, we can, perhaps, print a caricature or cartoon of massive tooth loss on candy bars, or images of permanent gas on soda bottles. What about depictions of domestic accidents on potato chip bags, box of fries or bakery shop products, like kids falling out of the chair from being overweight? To educate the youth on the meaning of adequate and healthy food is very important, too. 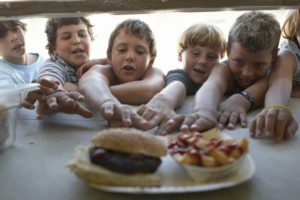 Teaching them the amount of food intake they need every meal, the right time to consume liquids, and when they are full are definitely not the only adequate measures of healthy eating. They need to know about nutritional value. Apparently, the strategies are not simple. If we are dealing with the situation from a national or global perspective, we need discrete actions that will require leadership, win-win partnerships, availability of data, and monitoring and evaluation. These are some of the measures suggested among the panelists on how they take action in facing obesity in their regions. But how about us as individuals, how can we create solutions within our own communities, like for our families, friends, co-workers, or even for ourselves? We must first live by example. We cannot correct the eating habits of any obese youth if we appear bigger or heavier than them. Nevertheless, this is the new world where the children are still the future, an unexpectedly heavy future. We must teach them well and show them the dangers of sugar and processed foods. We must take swift action to find the solution to the problem, as we are the ones responsible for raising them, and youth is always searching for a hero.